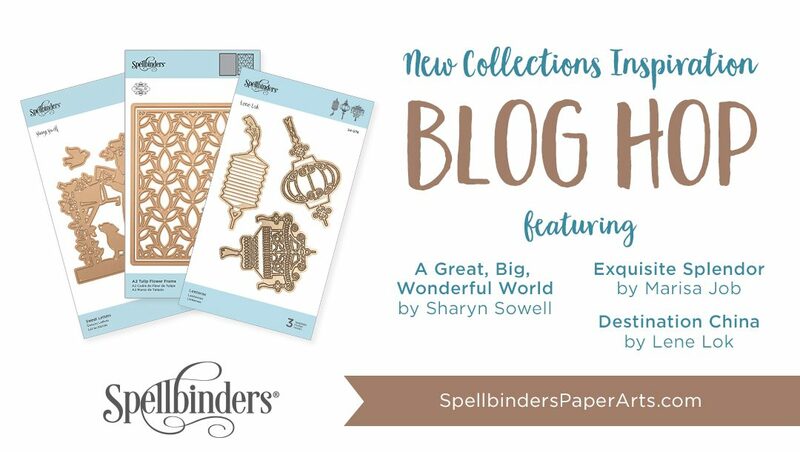 Hello Spellbinder friends! 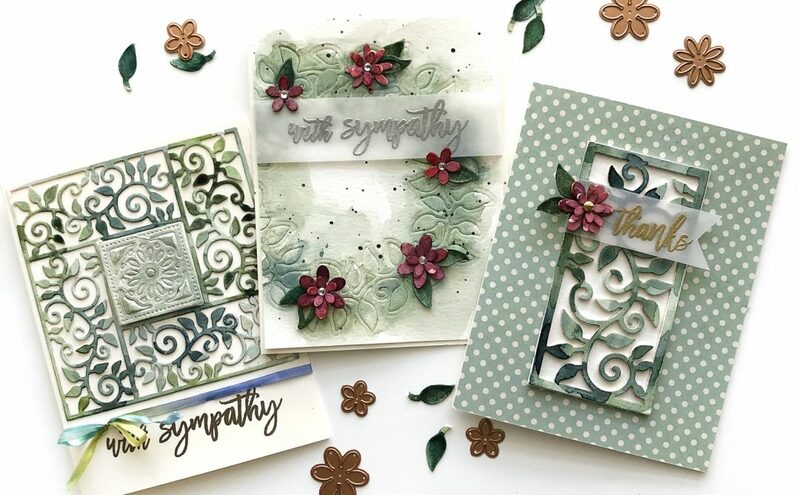 My name is Norine Borys and excited to contribute to the Spellbinders blog as a Guest Designer today! 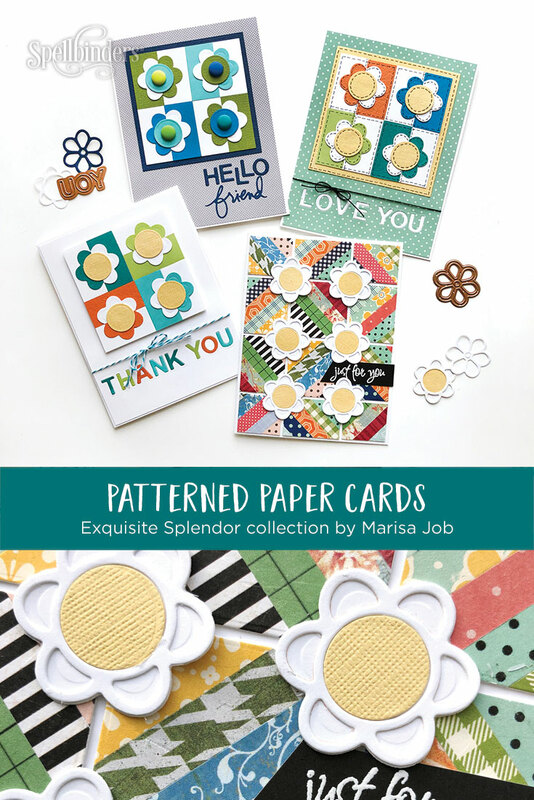 I’ve been working with a beautiful assortment of dies from the Exquisite Splendor Collection by Marisa Job. 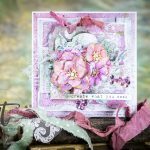 For the cards I’m sharing today, I mostly used dies from the Flower Box Card Dies plus one small square die from the Tulip Flower Box Dies. I’ve recently come from the Houston International Quilt Festival and I have quilting on the brain. 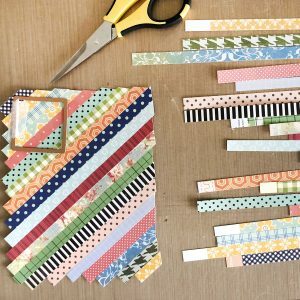 Because I love paper too much I will never actually BE a quilter, but I thought that with these card designs I could scratch the quilting itch and move on! 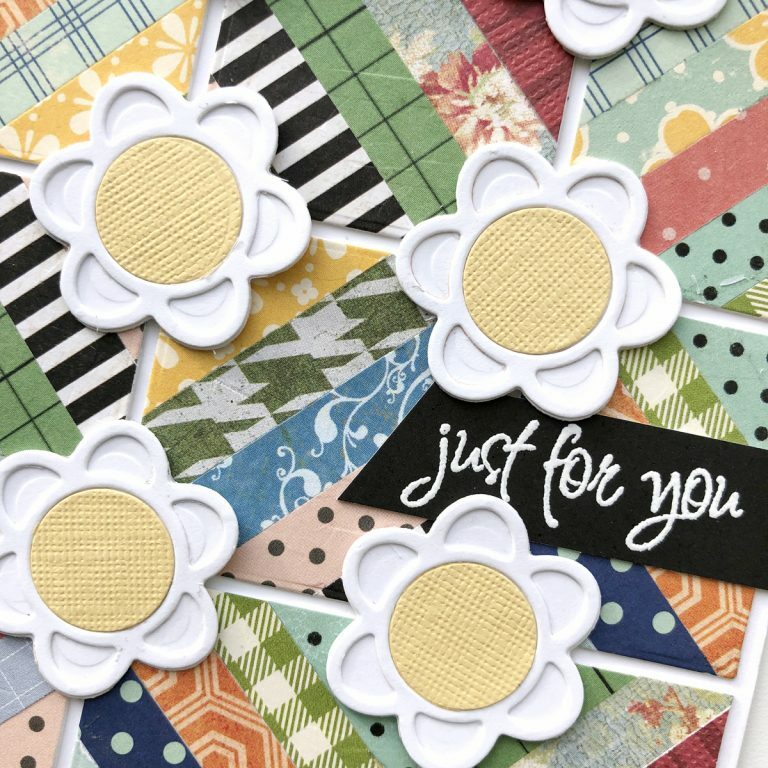 I kept all of the designs but one fairly CAS, drawing the line at actually using a needle and thread to create stitch lines, but using a very classic quilt design to make multiple cards. Lets get started! 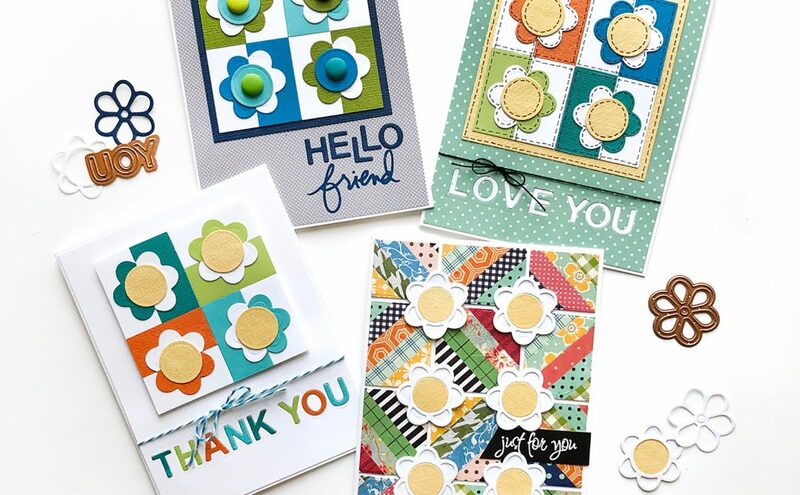 I chose a color scheme of blues and greens with a touch of orange, which generally works for any card recipient, young or old, boy or girl, and I cut lots of the basic flower shape from each of those colors plus white. Then I did the same, using the square die from the Tulip Flower Box dies to cut the background squares. You wouldn’t need to use the square die, but it was so much easier than measuring and cutting all those squares and rectangles. Using the die just eliminates any room for error. Then I cut all of the flowers and squares in half and adhered alternating colors of flowers to bases. 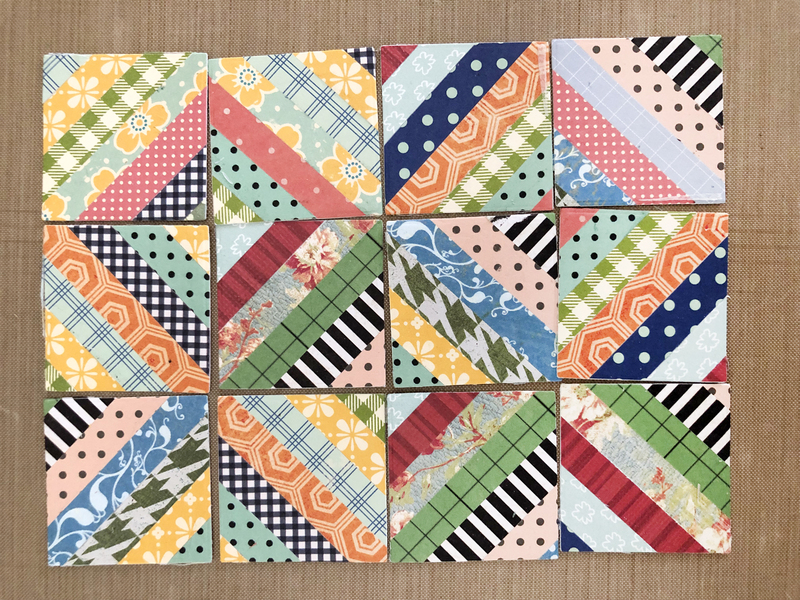 I glued them all back together in a basic quilt shape, added yellow centers and a coordinating yellow mat, and drew black stitch lines around the shapes. 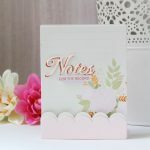 Before glueing the quilt square to the card panel, I die cut the LOVE YOU letters from the patterned paper panel as well as from some white card stock, and nestled the white die cut letters into the openings in the patterned paper. I tied a perky little bit of black thread around the card panel and adhered it all to a white card stock card base. The second card was made in much the same way as the first, just changing the quilt- pattern slightly, and keeping the overall design simpler. I die cut the THANK YOU sentiment in the same way, but inserted the coordinating colors of die cut letters and tied it all up with some baker’s twine. 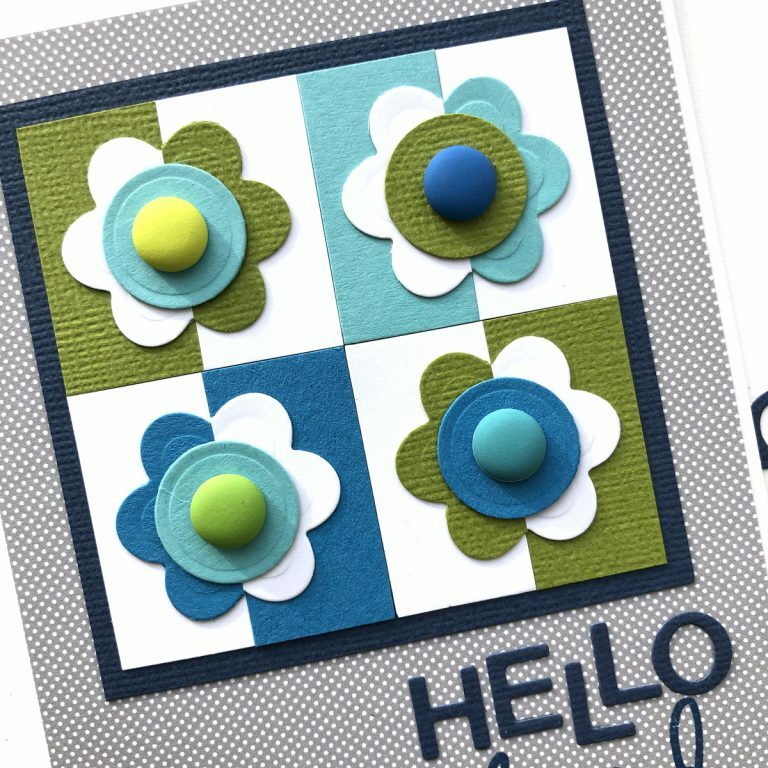 The quilt panel on this card is popped up with some fun foam for extra dimension. The third variation of this CAS card design is a result of using up the leftover bits of blue and green die cuts. 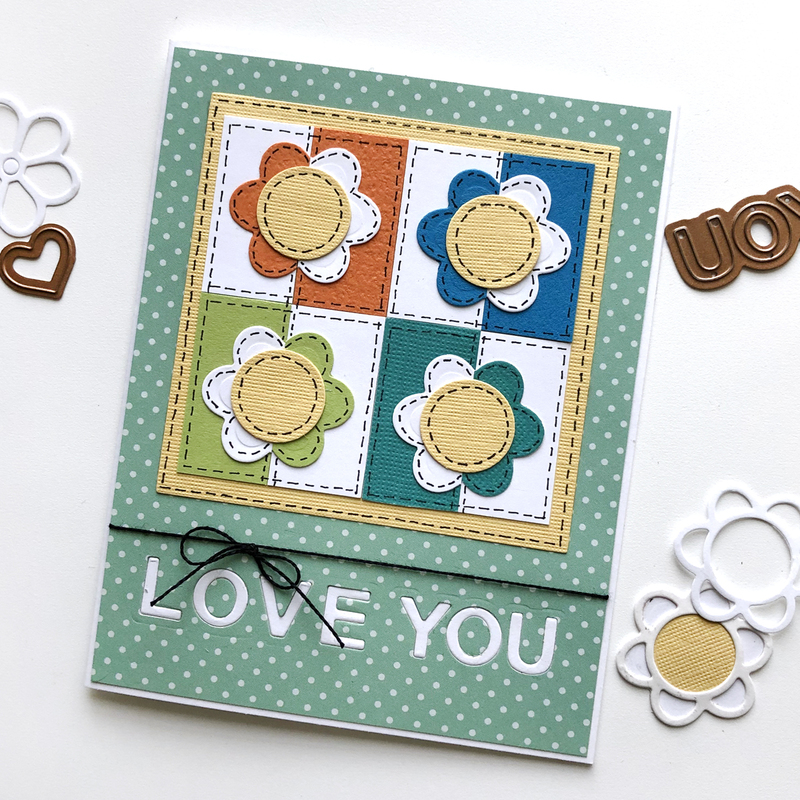 The Flower Box Card Die set has three word choices for die cutting; THANK, LOVE & YOU. However, from the THANK & LOVE, you can also make the word HELLO. So the sentiment on this card is a combination of die cut letters spelling hello, and a “friend” stamp from my stash. 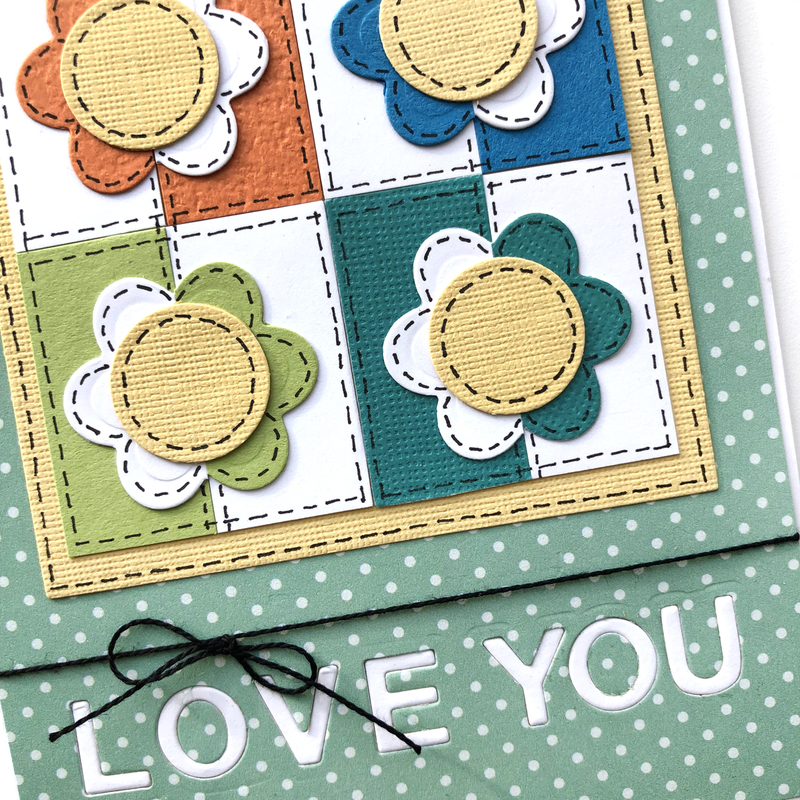 I also added some matte enamel dots to the flower centers on this quilted square. 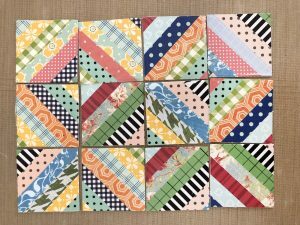 I feel like there are endless options of colors and patterns to create this basic quilt design. I confess, the quilting bug really grabbed hold of me for this last card! 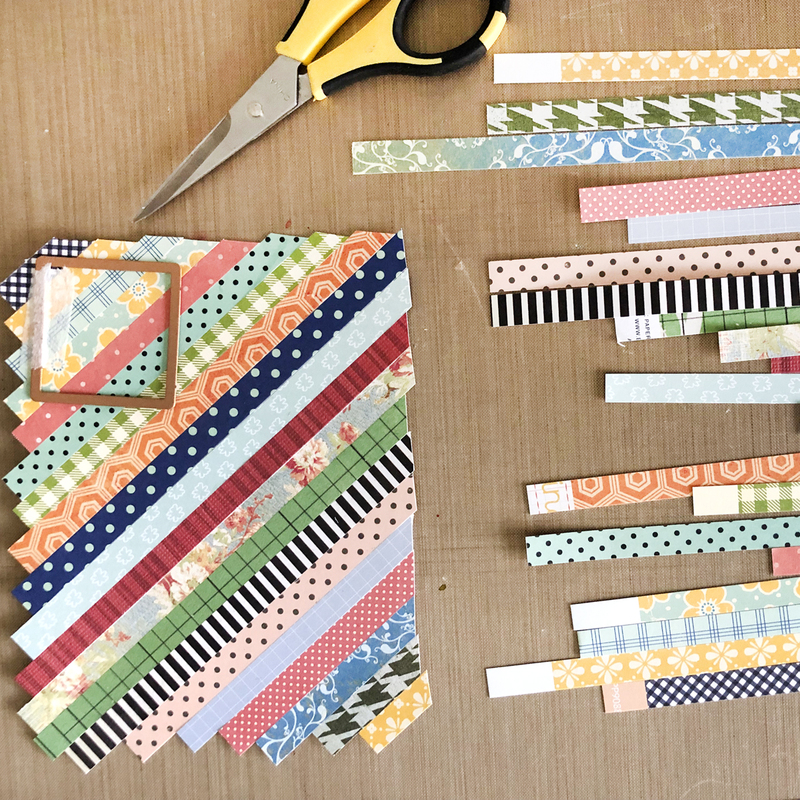 Yes, I actually cut up strips of many pieces of patterned paper from my stash, and glued them on an angle, to 2 pieces of A2 sized card stock. Then I used the square die from the Tulip Flower Box Die set again to cut 12 squares, which I then arranged and adhered to a card base. 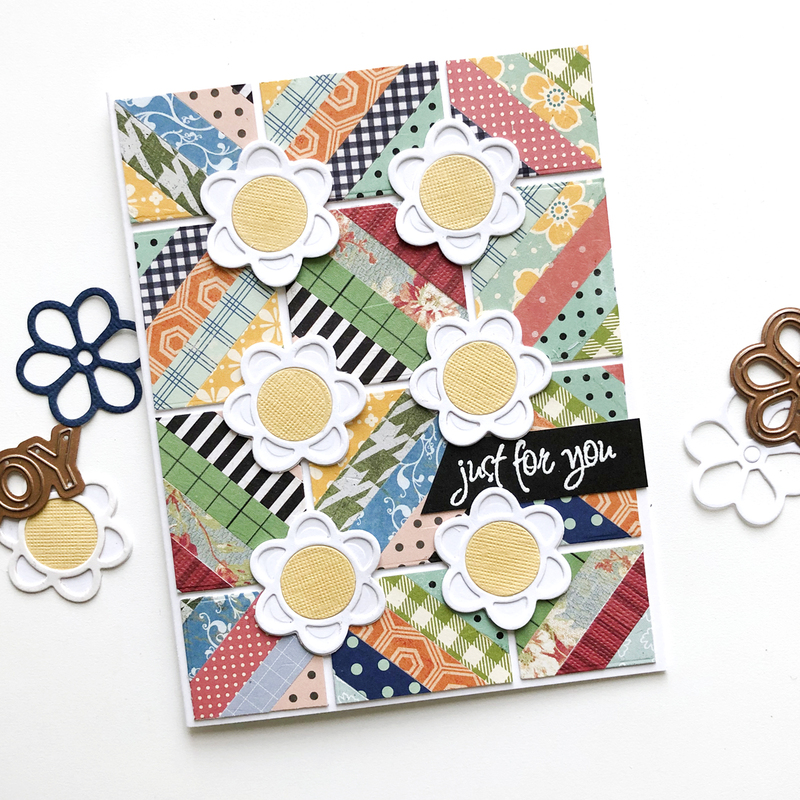 I cut 6 more flower bases and flower outlines from white card stock, and 6 flower centers from yellow card stock and adhered them to the intersections of the pattern on the card front. I stamped a simple “just for you” sentiment on black card stock and tucked it under the flowers on the card. 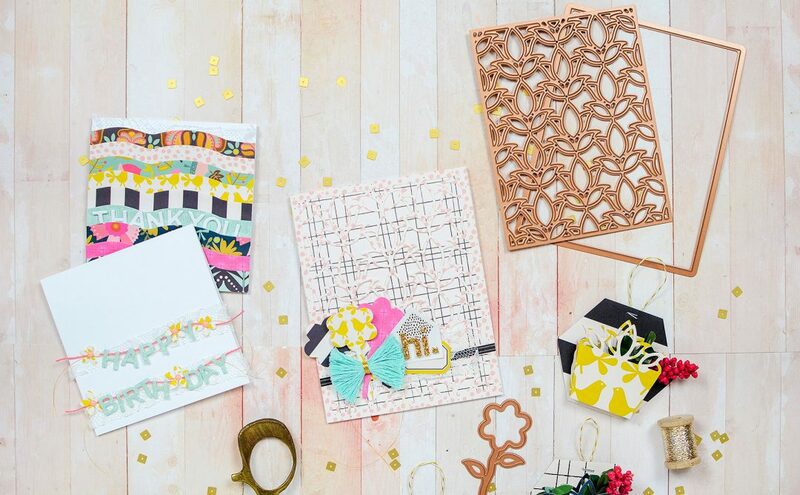 I’m sure you’ll agree, the card needs nothing more for embellishment, as busy as it is! 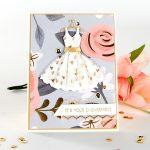 I had a lot of fun using these dies to create these 4 cards and I’m excited to return again in a few days to share some more card designs created with more of the Marisa Job Exquisite Splendor Collection. Thanks for stopping by today!